Nearly a year after my first visit to firstsite, I boarded the train at Liverpool Street to head back to Colchester for a second look. Everywhere has teething problems and the calibre of their latest exhibition sounded as if it was worth a return trip. For some reason, I’d managed to convince myself that the train journey into Essex was going to be a wonderful experience but the tiny train really let us down, not even having a café to serve the usual railway tea that barely catches a glimpse of the teabag. 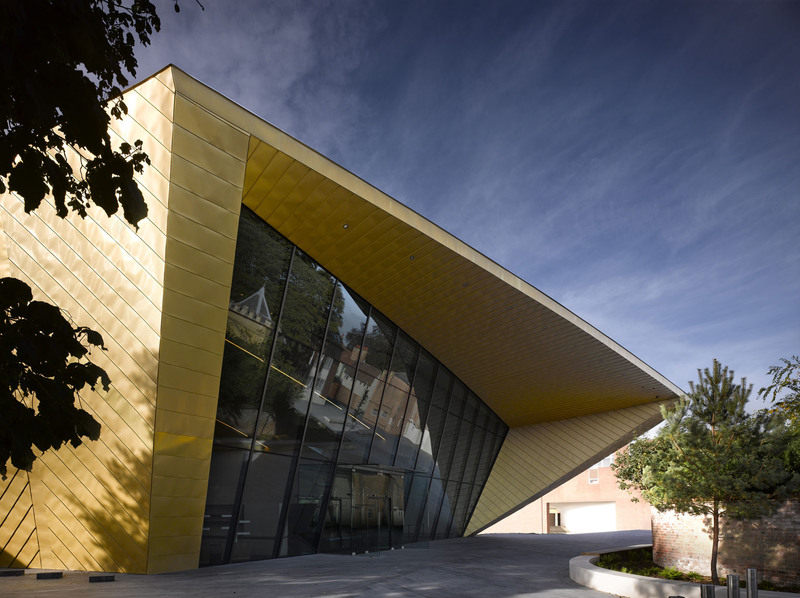 The impressive façade of firstsite. Image via www.firstsite.uk.net. 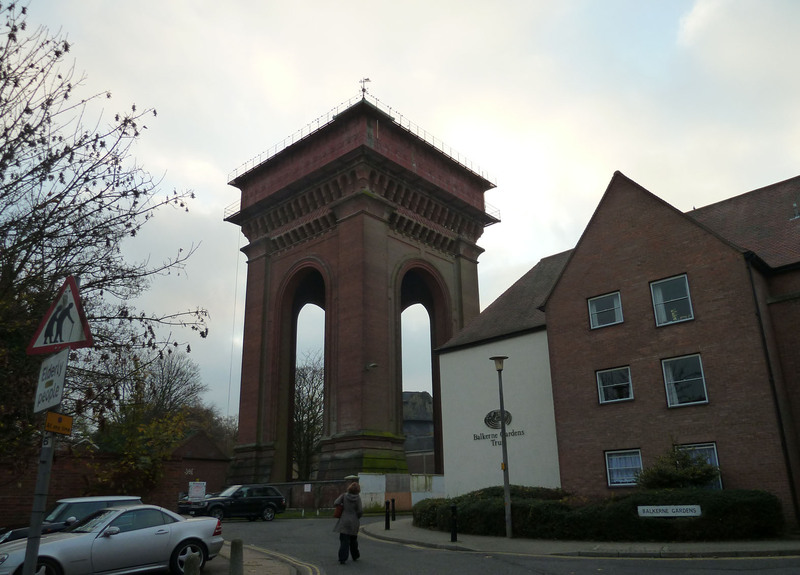 Getting into a cab at Colchester station, we struck gold with a driver happy to fill us in on the cultural and civic developments in the town which has been the recipient of several grants and is currently ploughing ahead with ambitious renovation plans. 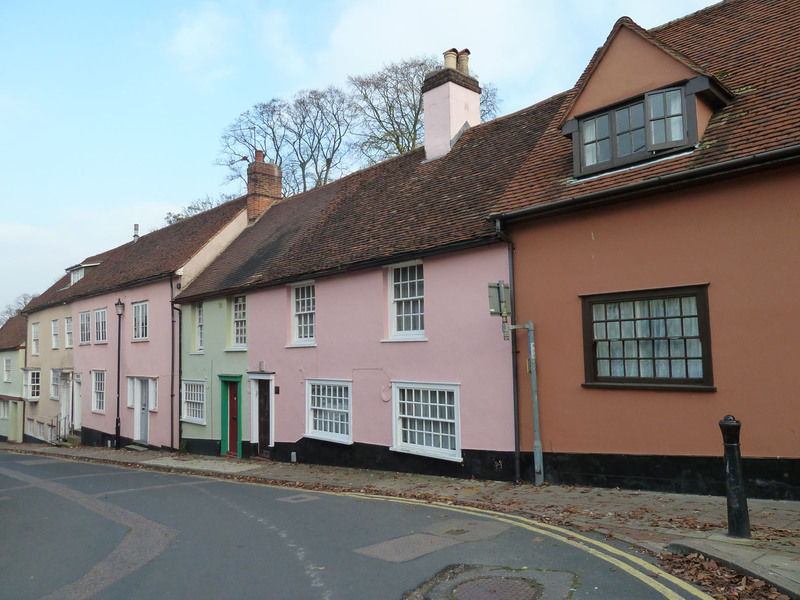 The main road is being partly pedestrianised, the castle is shut for an overhaul and two new hotels will shortly be gracing Colchester’s streets. Colchester really is working to pull in the crowds. 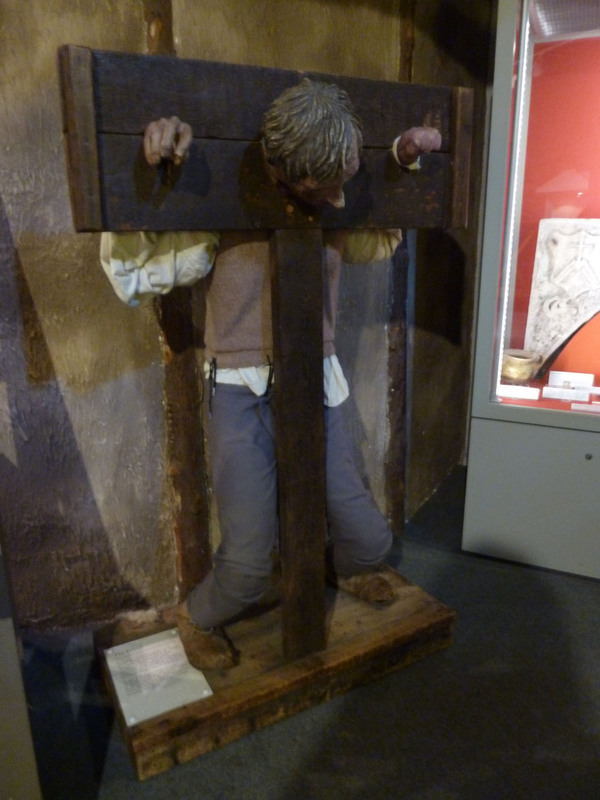 But, this particular driver had never taken anyone to firstsite before and has only actually been once himself. 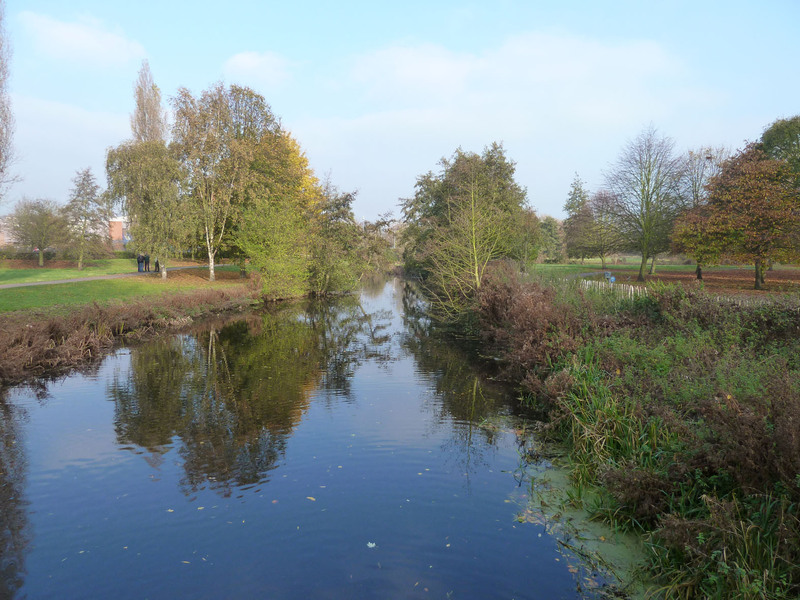 Many of my previous issues with firstsite remain and they are not going to go away in a hurry. Still proudly ranking as one of the largest contemporary art venues in the UK, firstsite is so full of dead space that at times it grieved me to walk past these missed opportunities. The Potential for mezzanine levels is everywhere. Own photograph. 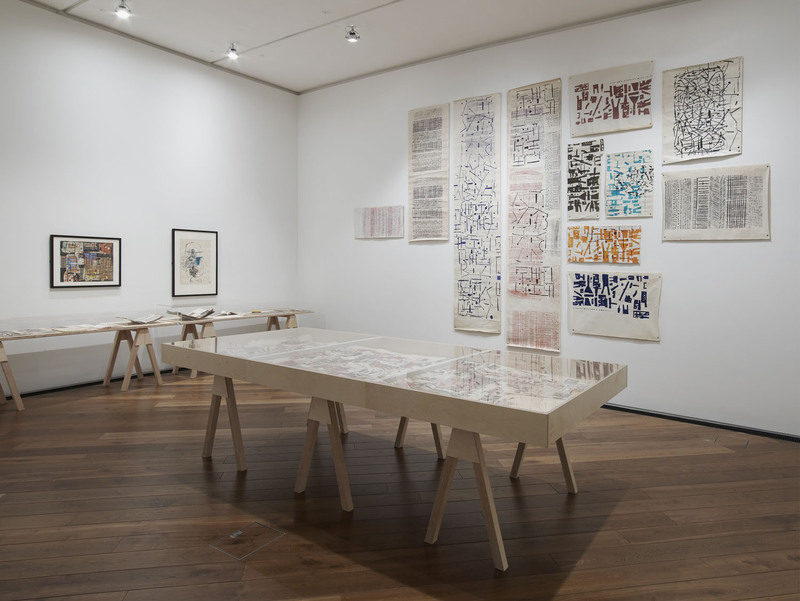 The main exhibition galleries are only a tiny part of the overall space and the current show focuses around Hammer Prints, the partnership between Nigel Henderson and Eduardo Paolozzi, charting the firm’s history with extensive previously unseen material that includes their original screens, photographs and test sheets. 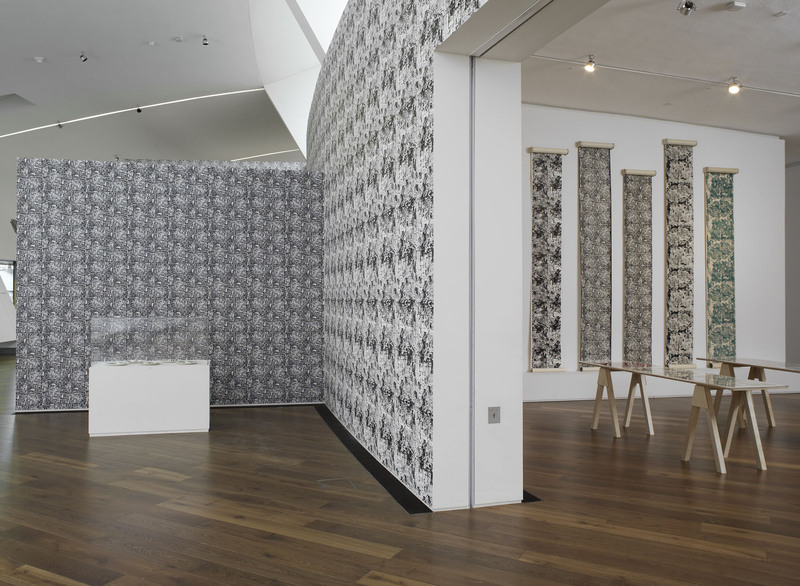 During 1954-1975, nine Hammer Prints were manufactured as wallpaper by Cole & Son and textiles by Hull Traders and went into production, becoming celebrated worldwide. The collaboration was not to last but the designs have become immortalised, instantly recognisable; the exhibition follows the development of these. 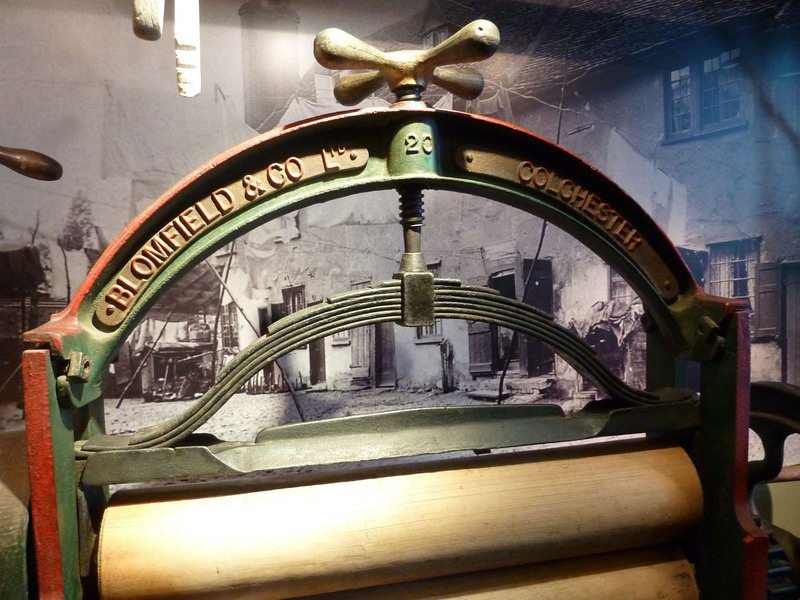 Some of the original screens used in making the prints. Own photograph. This is the first time since the company’s dissolution that the history of Hammer has been explored. 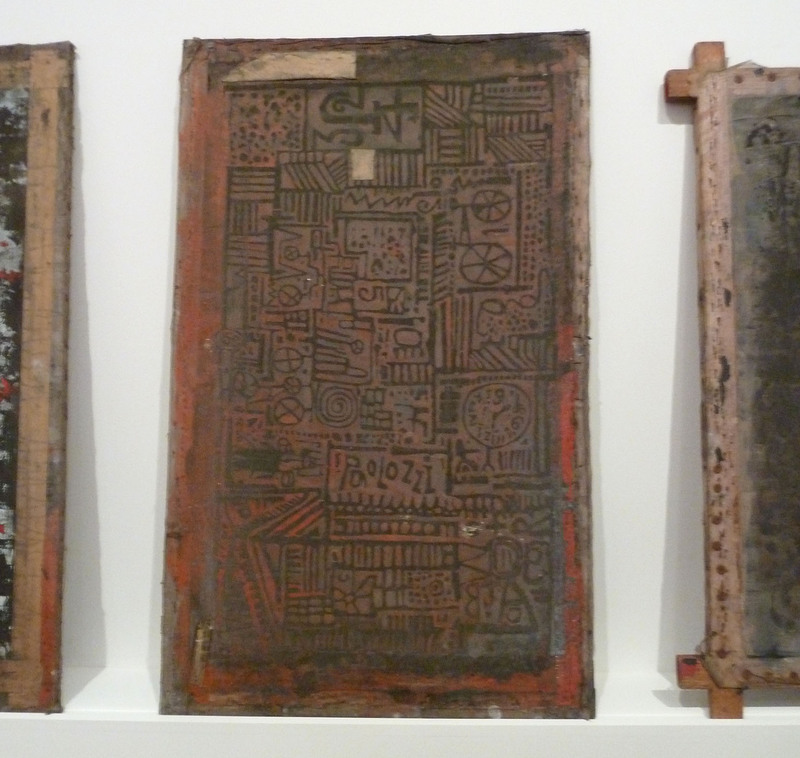 While people are fully aware of Henderson and Paolozzi in their own rights, most will have never heard of Hammer Prints. Although the exhibition opened in December, a catalogue will hopefully be available from next week that will enlighten the research developments further. Products for the gallery have been created using the original images, including beanbags that seem to be receiving a lot of attention and use, but unfortunately nobody took advantage of the merchandising potential and none of these is on sale! Due to the size of the space, the show obviously only covers a very small section of Henderson and Paolozzi’s output but it’s very well-conceived and pitched coherently to an audience who might otherwise be unaware of the techniques or the company. Installation view of the current exhibition. 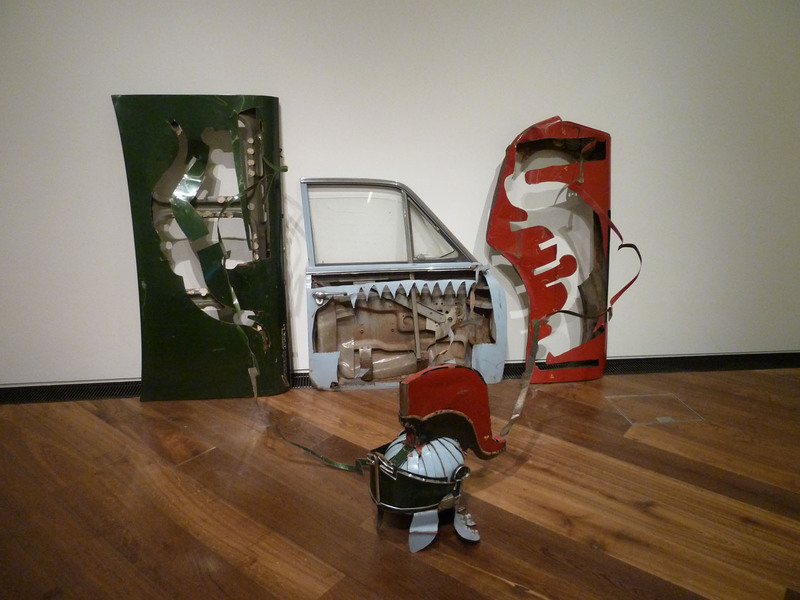 Photo via Andy Keate and www.firstsite.uk.net and courtesy of the estate of Eduardo Paolozzi. 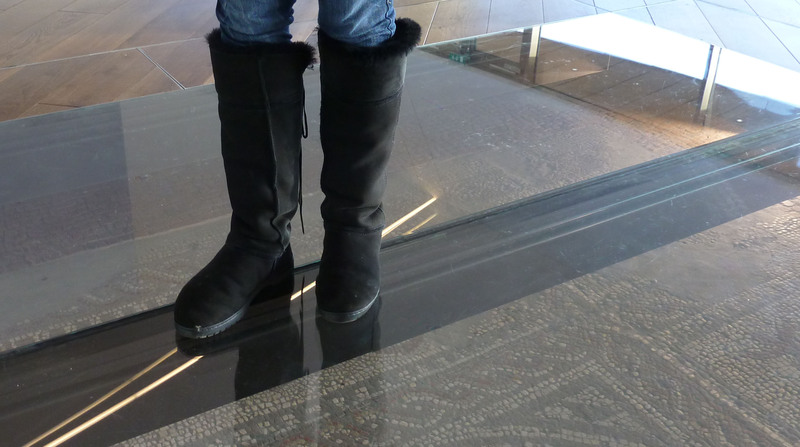 I’m not going to go into the architectural design of firstsite again but I must touch the thing that I feel is the most fundamental flaw of this gallery. Due to the banana shape, there is one huge curved wall and I have previously commented how this could be tackled with ingenious ceiling hangings or sculptural installations. 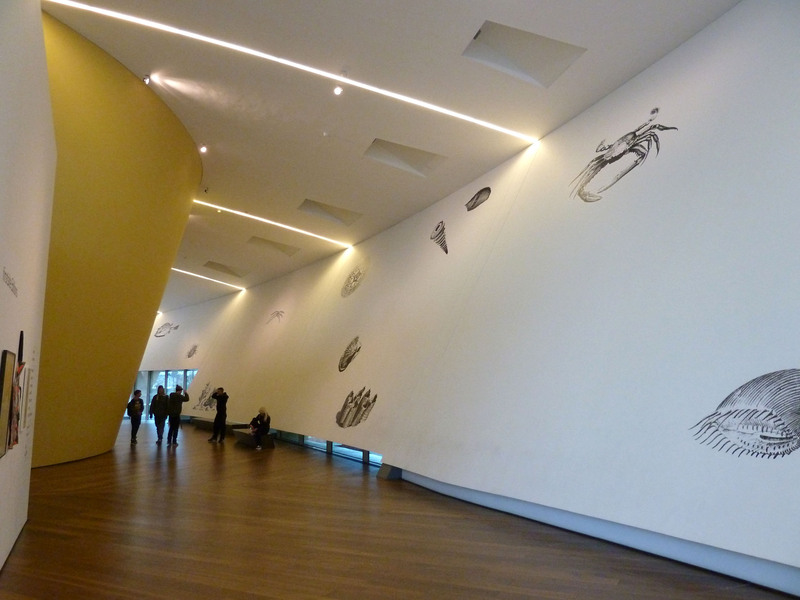 I am assured there have been some impressive murals in place over the past year but, for this exhibition, the curators decided to print a few stencils of the Sea Beasts on the wall and leave nearly the whole expanse bare and boring. Seeing that this wall dominates the entire building the sparseness baffles me. The exhibition designers apparently wanted to create something really immersive but I was left speechless when I saw what they had produced. The curved wall. Own photograph. 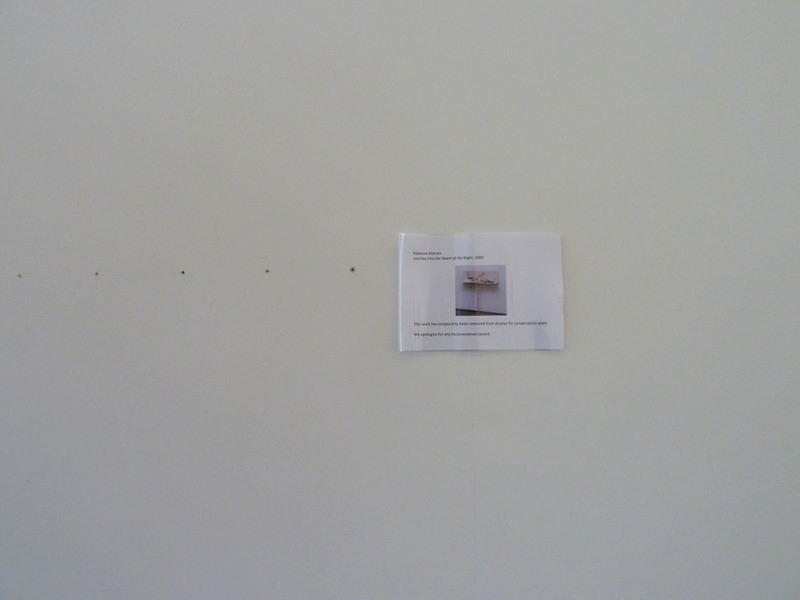 Yet, at the start of the exhibition, they had wallpapered the flat walls on which they could easily have hung more art. Surely the wallpaper would have been more engaging on the curved walls. These particular illustrations come from a series of plates found in an 18th century French encyclopaedia – the engravings were then photographed and made into a set of transfers that were applied to various ceramic objects. 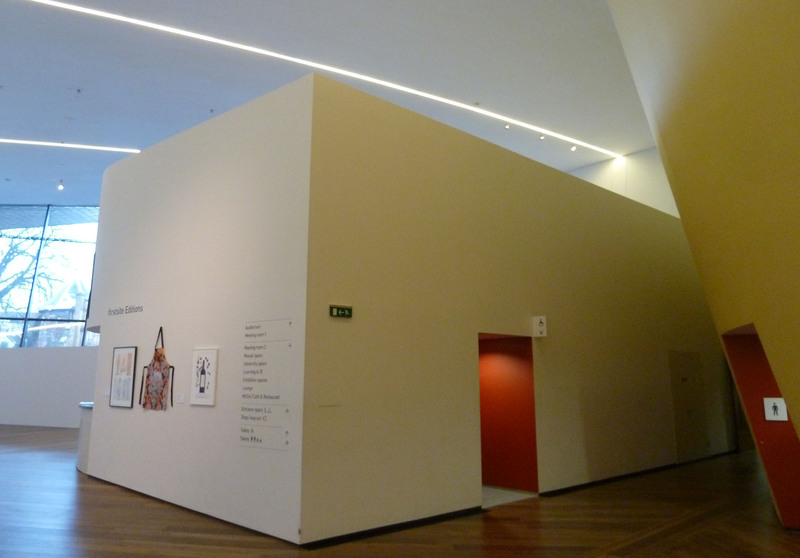 There is a permanent room in the gallery called ESCALA which is the Essex Collection of Art from Latin America. Currently on display is David Pérez Karmadvis’s photography and video work broadly exploring the predicament of Haitian migrants in the Dominican Republican and the issues of border politics. The works are very powerful and the accompanying exhibition guide provides a thorough and interesting explanation of the thought-process. 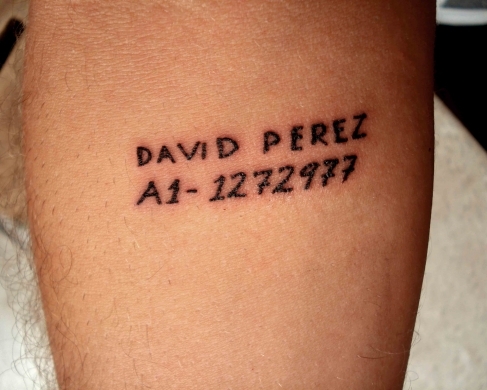 For the work Identificaión, Karmadvis contracted a tattoo artist to brand people’s names and identity numbers onto their inner lower arms, where prisoners would have had a serial number marked. Therefore, in case they disappear or their features become unrecognisable, this tattoo will remain to identify them. The harrowing ideas at play here pack a fairly hefty punch. David Pérez Karmadvis, Identificaión, 2007. Image via www.escala.org.uk. 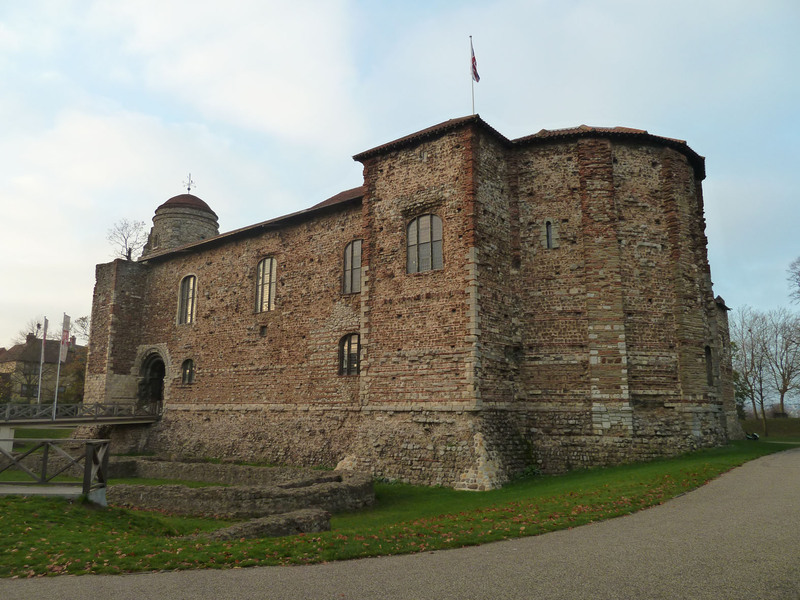 The events programme at Colchester is to be applauded – they have talks and tours (the enthusiasm of the guide who showed us around was infectious), art courses, dance classes, family days and a film programme that includes Picturehouse screenings from the Royal Opera House, Met Opera and National Theatre. There is also a community art space and a schools programme which is going from strength to strength. 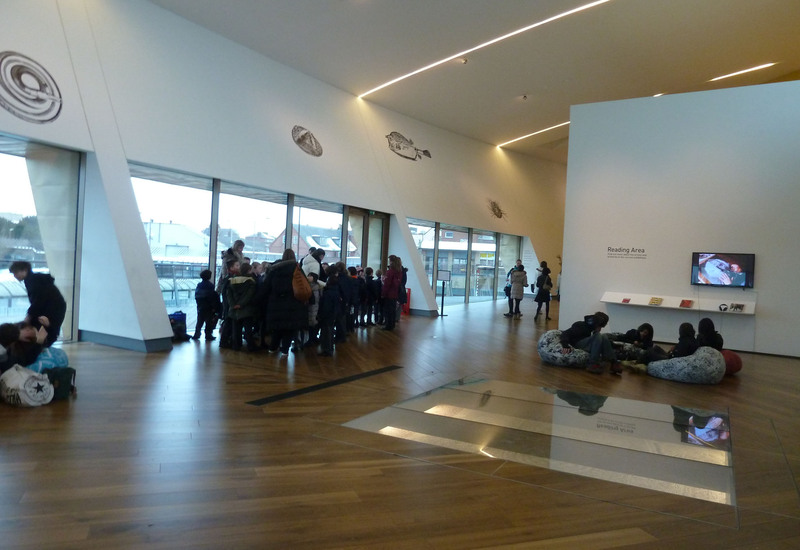 firstsite get a fair amount of visitors; in their first year, they welcomed 172,000 people . How many of these, however, are schoolchildren or people solely there for the events? 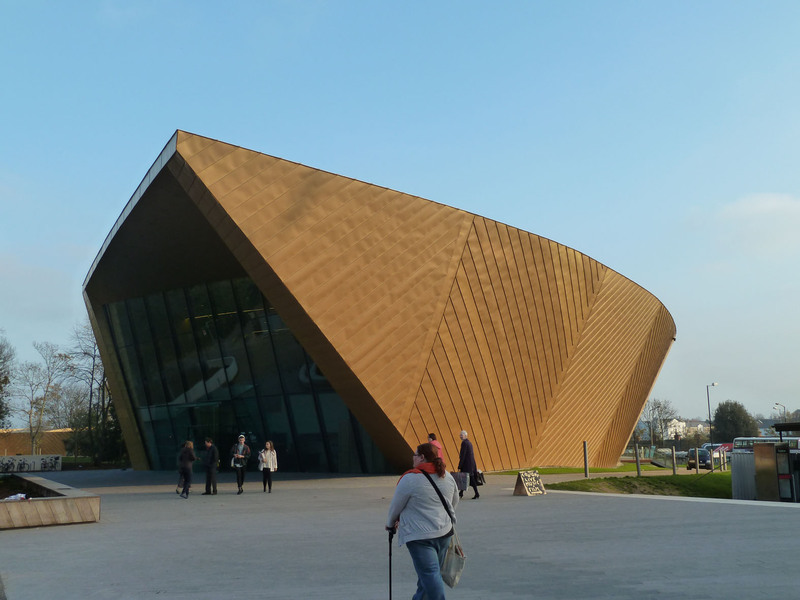 For me, it isn’t really a gallery – it’s currently a local community centre housed in an impressive building but there’s not necessarily anything wrong with that. The ‘reading area’ with the beanbags. Own photograph. In terms of the art, it really doesn’t take long to get round the space and it’s certainly not yet offering enough to merit a full day out. The new director, Matthew Rowe, is starting any day and maybe he will herald a turning point for the gallery. I so want this space to work but there’s still a lot of work to do. 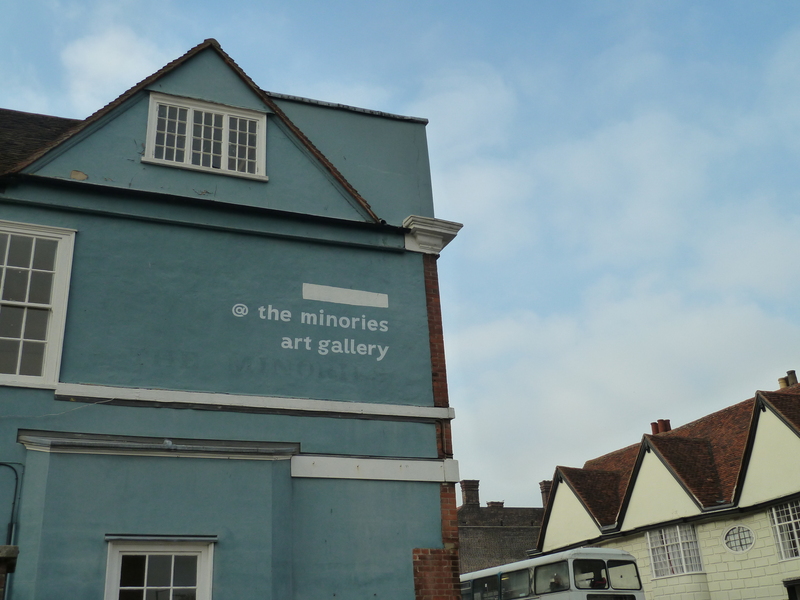 After wandering round firstsite, it was time to visit to The Minories Galleries – a site run and managed by the Colchester School of Art with some rather lovely studio space in the upper rooms. Their current show is a three-room exhibition of works by Ron Sims – in actual fact, the exhibition extends discreetly over the whole building and the staff are happy to open up officially closed areas for anyone to have a peek. 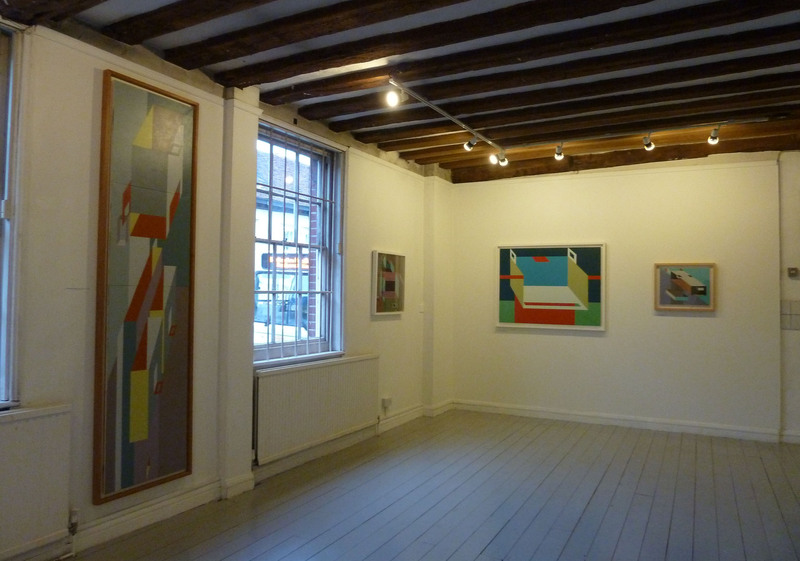 Ron Simms at The Minories Gallery. Own photograph. 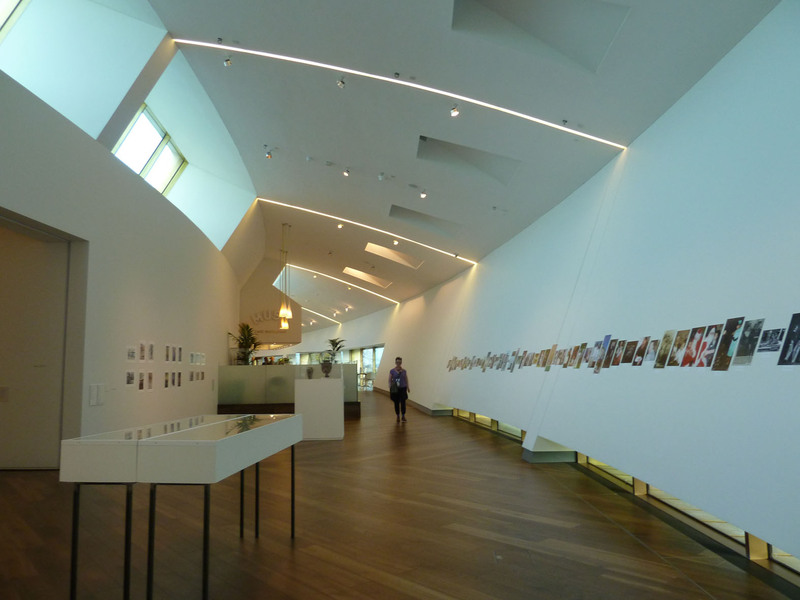 The exhibition works well alongside firstsite and the two organisations seem to be working collaboratively and existing in happy partnership. Sims produces groups of clearly defined shapes and forms that create boundaries and define dimensions. His works have strong structural compositions, seemingly constructed by manipulated surfaces and visual planes. Although only small, this space is working well and really utilising the whole building. 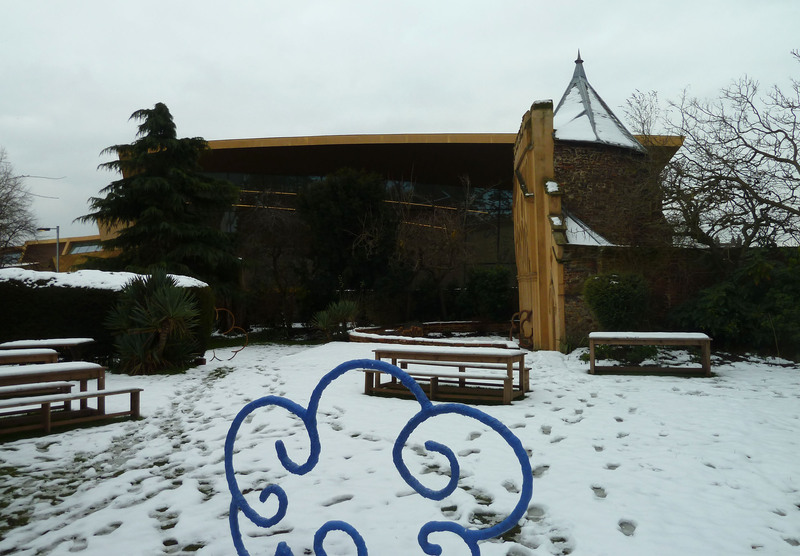 firstsite seen from the garden at The Minories. Own photograph. I’m pleased to say the train home had armchair-like seats and the much-desired restaurant with tea as expected. The countryside whizzed by and before we knew it we were back in London and I was off to see the state of the Waterloo tunnels after they’d been cleaned while we were out of town. Nigel Henderson & Eduardo Paolozzi: Hammer Prints Ltd, 1954 – 75 is at firstsite until 3rd March 2013, www.firstsite.uk.net. 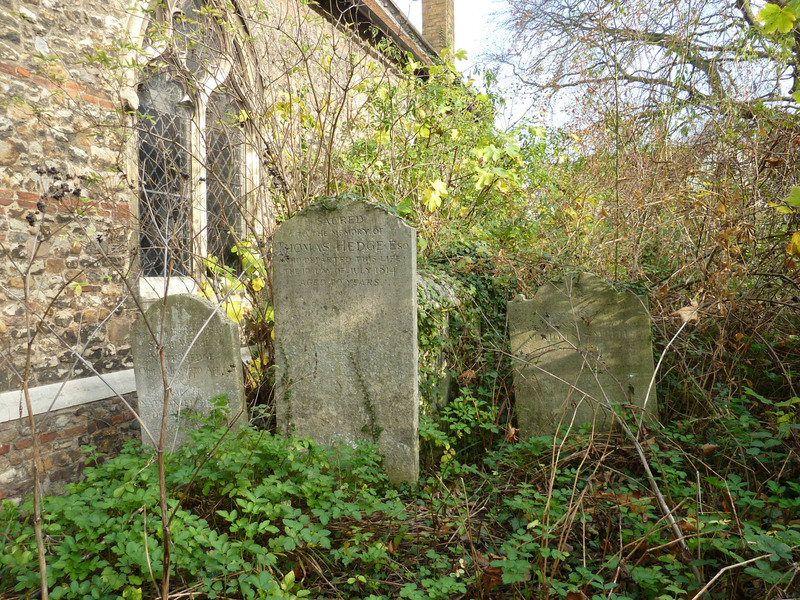 Ron Simms: Visual Genetics, Human and Animal is at The Minories Galleries until 9th March 2013, www.colchester.ac.uk/art/minores.